The need: People are the key driver of sustained farm business success. In 2005 a national priority-setting process formalized the need for strong farm business culture, better management skills, efficient and adaptable farming systems, and higher satisfaction and retention of people in the industry. All these qualities are a function of how people operate in the space. What we did: The People in Dairy was an opportunity for the Harris Park Group to design a vital culture change program for Dairy Australia from ‘the ground up’. The program provided the RD&E leadership for ‘everything relating to people’, articulating a bigger picture of how the various components (such as Human Resource management on farm, regional workforce planning and dairy industry career initiatives) contributed to the program objectives. 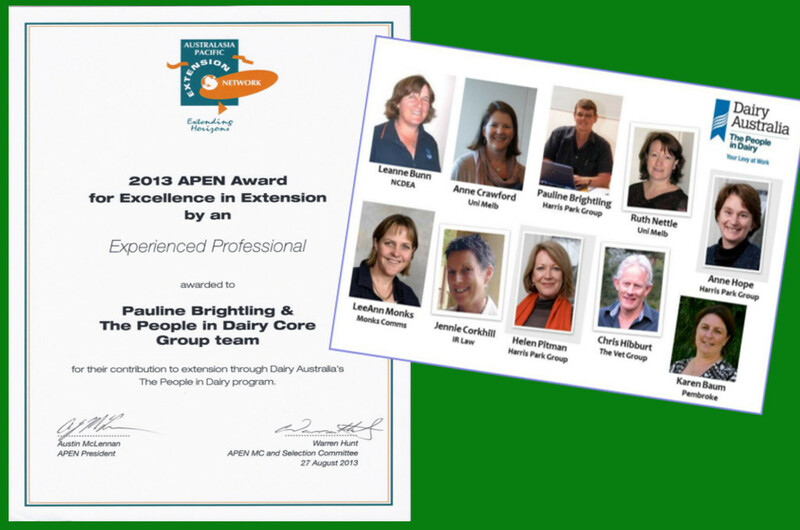 The People in Dairy winning the 2013 Australasia Pacific Extension Network Award for Excellence. Transforming the people culture on dairy farms is a long-term prospect. Dairy Australia has continued with this commitment, taking full leadership of the program since 2013.